Djokovic, seeded 12th, won 6-2, 6-2, 7-6 to claim a 13th slam – and his first major since the 2016 French Open. The Serbian dominated the men’s game earlier this decade, holding the number one ranking for a record 223 weeks and completing a career Grand Slam. But his form and fitness have since dipped, with injuries and personal issues leading to him dropping out of the world’s top 20 for the first time since 2006. Seeded 12th, he came into Wimbledon on the back of a frustrating year blighted by an elbow injury, but had looked close to his best in his run to the last four on the grass at the All England Club. His opponent in the final had appealed to event organizers to devise a better method for determining final set victories after a semi-final against John Isner of the United States that turned out to be the second longest Grand Slam match ever played as he eventually won the fifth set 26-24 to end the match at six hours and 35 minutes. That had a knock on effect for Djokovic, however, as he and his opponent in the second semi-final, Rafael Nadal, were delayed in their start and had to complete their match yesterday after Friday’s (July 13) play was halted at 11 p.m. with Djokovic leading by two sets to one. The Serbian, 31, quickly took control to win the opening set in 29 minutes, breaking twice more in the second set. 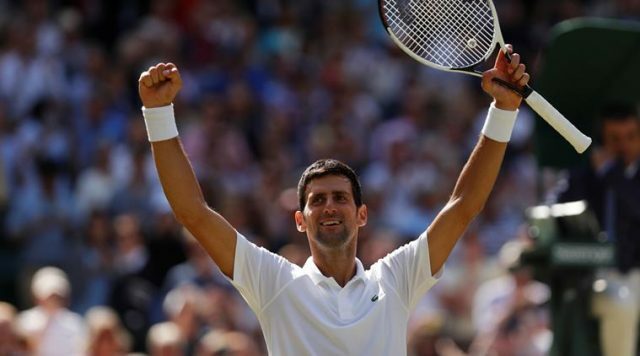 “I had many moments of doubt, I didn’t know if I could come back to this level to compete,” said Djokovic, who also won the Wimbledon title in 2011, 2014 and 2015. He is now in outright fourth place on the all-time list of Grand Slam men’s singles title winner moving clear of Roy Emerson and closing the gap on Roger Federer with 20 Nadal with 17 and Pete Sampras with 14. Meanwhile, the 32-year-old, 6ft 8in tall South African is left searching for his first Grand Slam title having now lost two finals, the first being at the US Open last year when he was beaten by Nadal. Germany’s Angelique Kerber beat seven-time champion Serena Williams to win her first Wimbledon title. Kerber, 30, produced a powerful and controlled performance against the 23-time Grand Slam champion from the United States, winning 6-3, 6-3 to add this title to her 2016 Australian Open and US Open crowns. Williams had been the favorite despite it being only her fourth tournament since giving birth to a daughter in September, after which she had severe health complications. 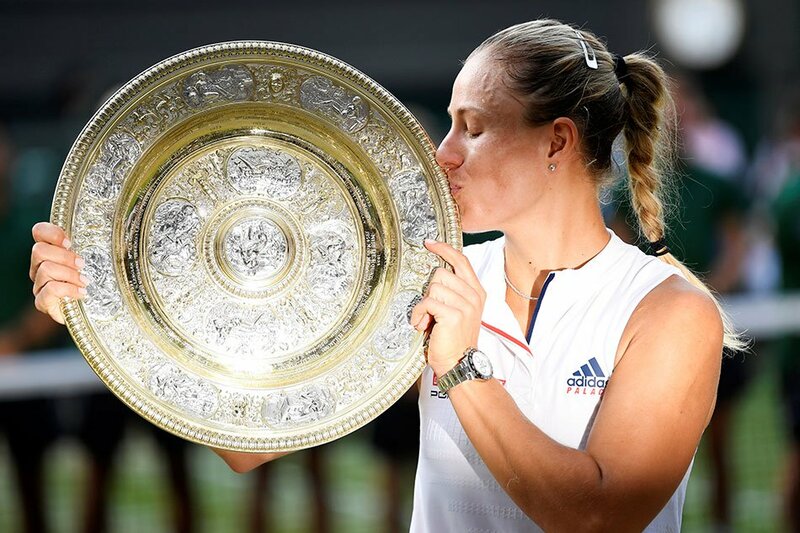 “When I was a little kid, I was always winning one time the Wimbledon title,” said Kerber, the first German winner since Steffi Graf in 1996. “The dream came true today. “To play against Serena is always an honour. International Olympic Committee President Thomas Bach was in today’s crowd at the All England Club alongside British Royal Family members the Duchess of Cambridge and the Duchess of Sussex. The two women finalists had to wait for their Centre Court moment until the Djokovic-Nadal semi-final was completed at the grass court Grand Slam this afternoon.